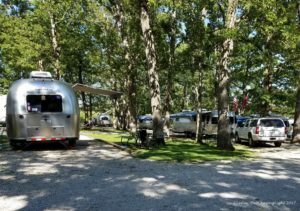 Recently I attended a St. Louis Chapter Airstream Rally after being invited by a close friend who was my host. It was a great time! 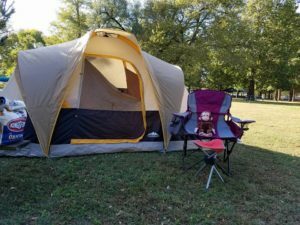 I was welcomed with open arms, despite my Northwest Territory tent, which was pitched on a shady spot down a little hill, mere feet away from their bright shiny aluminum traveling rigs. It didn’t take long, like going out to lunch with the group on the day that I arrived, for me to feel totally comfortable with this group of new friends. I felt as if I’d known them all for years, and in my own way I did-, they reminded me of my folks and our family travel trailer adventures, and the friends we’d made along the way through those years. Those are memories that I treasure, and it was good to be reminded of them, and to be with like minded people who enjoy the outdoors and the activity we call “camping”. Being at a Rally as a “newbie” I was given an itinerary of events that would keep me apprised of activities happening throughout that weekend. 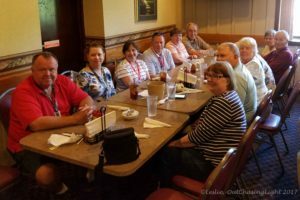 There were visits to a local museum, and tours of a local vineyard and winery (we were in the vineyard country of Missouri), attending a “French Days” festival at a historic town, and meals at restaurants that we visited as a group. Since I don’t drink wine, and went to the Taylor Wineries as a Kid in Upstate NY, I opted to skip the vineyard activity, and instead used my “free time” to go out hunting for photo-ops as I went “Out Chasing Light”. That’s totally cool too, if one needs down time, one can skip an activity. However, if a “head count” and reservations are placed at a restaurant for the group, it’s proper and polite to attend that activity. Part of the group on our dinner outing. 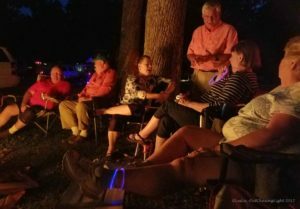 Then there’s my favorite activity; the campfire! This is where one hears the stories of some of their adventures together. And, this is where the laughter really goes down! I mean seriously, if one can imagine overgrown scouts, girls and boys, sitting together, laughing, sharing their stories, talking about future trips, and did I mention hilarity? Airstreamers are in one word fun! Just plain fun to be with. Someone always has a campfire to gather around. All in all, I would say attending a Rally is akin to being at a camp for adults for a long weekend. It’s entertaining, and by the time a campground goes dark, one is ready for a sound night’s sleep! Here’s what I learned about Airstreamers: they love traveling and the camping that goes along with road trips. They like being together in a group and the activities that they do as a group. They cook breakfast on their stoves outside, just like other campers. They like to laugh and have good times, and they like their campfires. They’re just like me, except for the tent thing. I learned that many of them have been tenters before too, or camped in something else before owning an Airstream. If money were no object in my life, I’m sure I’d buy an Airstream. The travel trailers are without a doubt delightfully comfortable, and have a history and reputation that is hard to ignore. Yet after this experience, I think the greater reason to join the group known as Airstreamers, would be to attend more Rallies, Caravans, and Internationals! Thank you to all the fine folks I got to meet and know through our time together, I am enriched!